SoundToys is about to unveil a new plug-in at the upcoming AES. Decapitator models the saturation or distortion created when driving professional analog studio equipment. SoundToys analyzed vintage and modern classics from Neve, API, Ampex, EMI and Thermionic Culture, and more to create accurate models of high-end studio gear. 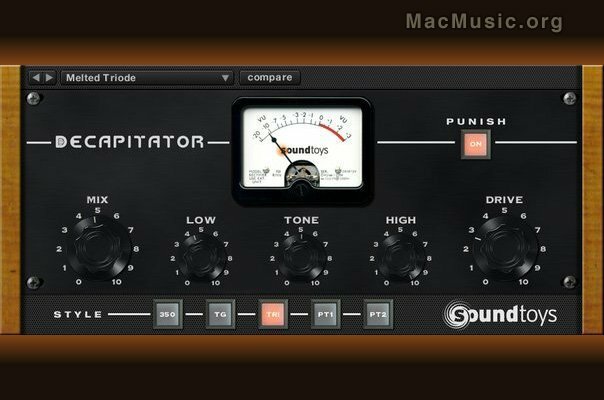 Decapitator creates that highly sought after analog sound from subtle harmonic changes to extreme driven distortion. Decapitator features an intuitive interface with the look and feel of classic analog gear. A selection of tone controls including high cut, low cut, and a single "Tone" knob give you additional shaping control that take many of these classic sounds past their original design. The "Punish" button pushes even more gain through the modeled saturation circuits for more extreme drive. It also features a "Mix" control for blending the original sound with the sound of Decapitator, without the need for routing and bussing, and built-in auto leveling controls the output volume for a perfect balance automatically, even in the "Punish" mode. Available 4th quarter 2009 for TDM/RTAS/AudioSuite, AudioUnits, and VST. More details and demo versions will be posted on their website as they become available.